Relationship dog tags are great to give to your best friend. 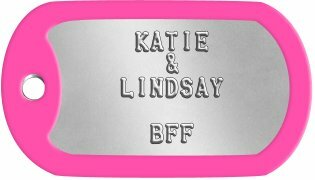 Consider designing a personalized matching set of BFF (best friends forever) dog tags. Because each order of dog tags comes with two in a set, keep one dog tag for yourself and give one to your friend as a gift. 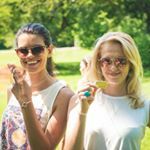 Think of our dog tags as the modern version of a friendship bracelet! Our silencers come in a variety of colors and patterns, so you can pick matching silencers so your friendship set is an exact match or you can choose to customize your dog tags in each of your favorite colors. Dog tags are an inexpensive yet personal gift that your best friend will love. Do you have more than one best friend? We make it easy to order multiple sets of dog tags, and we offer bulk order discounts. The more dog tags you order, the more you will save. Even if you place a bulk order, you'll still be able to customize each set of tags individually, making them perfect for all of the friends in your group! Customize to Buy your Best Friends Dog Tags now! Looking for a personalized gift for the special person in your life? Some people wear their hearts on their sleeves. Why not wear your heart around your neck on a set of custom dog tags? Our dog tags are perfect for any type of relationship -- friendship, boyfriend & girlfriend, husband & wife, and more. Dog tags personalized with a custom heartfelt message make a great gift for any occasion -- birthday, anniversary, Valentine’s Day, or just because. 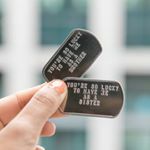 Customize your dog tags with a romantic or cute message, or perhaps an inside joke! Your loved one will cherish the gift of a set of dog tags unique to your relationship. Best of all, our dog tags are very affordable, so you can design a romantic gift without spending a lot of money. If your significant other is in the military, checkout some of our military sweetheart dogtag ideas! Let's face it ladies. It can be really difficult to find a special gift for the man in your life. You have to find a balance between choosing something that's masculine enough but also has meaning without being too sentimental (or “mushy” as some say). Dog tags are a great gift for any boyfriend, husband, or other important man in your life. They are masculine and stylish enough to be worn every day, and at the same time, can include a message that has special meaning to you as a couple. If he's in the military, add a charm that represents his branch of service. And even if he's not into wearing the dog tags as a necklace, he can put them on a keychain, hang them from his rearview mirror, and much more! You'll also want to check out our selection of paracord bracelets and leather cuffs that can be customized with a personalized dog tag as well. When you order a set of dog tags for your boyfriend, girlfriend, husband, wife, mom, dad, son, daughter, or friend, you will find that our dog tags are anything but plain since you can design a message and style that fits your unique relationship. Because you can customize your dog tags with your choice of rubber silencer in a wide variety of colors and patterns, they can be a great accessory to an outfit. Your dog tag order comes with one set of silencers included, but feel free to order additional silencers in different colors so that you can change them whenever you want. 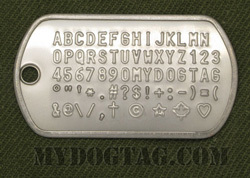 At MyDogtag.com, our personalized dog tags allow you to design a custom set of two dog tags with any text that you want. You can wear your dog tags as a set, give one to a loved one, put them on a keychain -- there are plenty of options for how you can use your uniquely designed set of two dog tags. Although dog tags originally started out as a way to identify soldiers, today many people wear them to show they are part of a relationship that is meaningful to them. You will never have to worry about your message fading because it will be printed on military grade stainless steel. When you wear your dog tags as a necklace, you will be keeping your loved one close to your heart. All our dog tags are available to purchase with gift packaging so your personalized dog tags are ready to present to your loved one. Consider upgrading to a mini hinged tin box that can be laser engraved with an additional custom message to add an extra special touch to your gift. • At Christmas time, make your wife or husband an ornament incorporating the dogtags. -Hang the dog tags over the corner of a picture frame with a photo of you with your boyfriend or girlfriend. • Decorate your locker or backpack with dog tags from your BFF. • Make a shadow box to represent your relationship with items that are important or sentimental, including the dog tags. • Create his and hers matching keychains when you add your set of dog tags to a keyring. • Make a personalized bracelet using a dogtag. Guys love our paracord bracelets and leather cuffs! All orders are shipped within 1 business day and are usually delivered within 1 week (in North America). If you need any assistance creating or ordering your Best Friends Dog Tags please contact us directly, we are here to help!